Twitch is offering yet another free DLC for Prime members, and this time it’s for Call of Duty: WW2. Earlier this week, Twitch announced the second Fortnite loot pack for Prime members. This is not all Prime will be getting this month, because there’s a DLC pack for Call of Duty: WW2 available starting now. 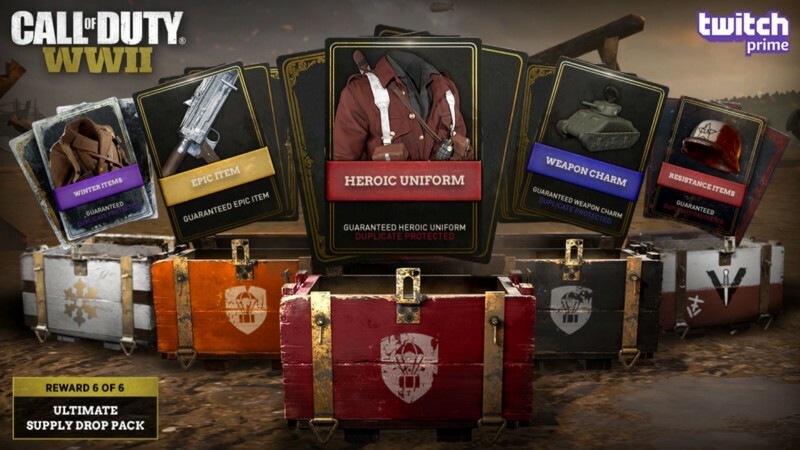 The Ultimate Supply Drop Pack comes with Heroic Uniform, Weapon Charm, Winter and Resistance items, and a guaranteed Epic item for a total of five drops. These are Bribes, meaning they’re duplicate-protected. Unless you own every cosmetic item in any of these categories, you’re going to be getting something new. This is actually the last of six Call of Duty: WW2 DLC drops, which started all the way back at the game’s launch. All you need to do is make sure your Twitch account has an active Prime subscription. Just click the loot icon on the top right on Twitch, and you’ll find the Call of Duty: WW2 pack there. If this is your first time signing up for Prime, you’ll also get the Bomb Voyage weapon camo on top of everything else. Head over to Twitch to claim it.